JULY 27, 2004: 1000 PDT (FTW) -- Amid a towering cluster of office buildings in northern Virginia stands a 10-story red brick and glass edifice. One of many new office buildings rising along Arlington County's growing Rosslyn-Ballston business corridor, the structure nestled at the end of a cul-de-sac at 2107 Wilson Boulevard has a special mission this year: to ensure that the Bush-Cheney administration is guaranteed another term in office. 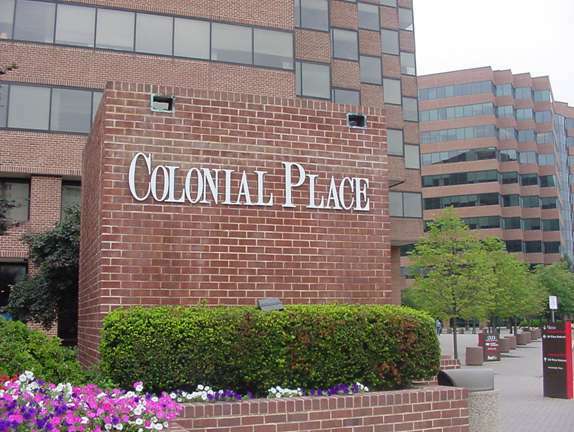 One of three buildings in the Colonial Place office complex, Bush-Cheney headquarters has some special features that its two neighboring buildings lack: 360 degree pan and zoom cameras that resemble street lamps and roving private security guards. The reasons for the added security are quite understandable: working at the building full time are Bush-Cheney campaign chairman Marc Racicot; Ken Mehlman, Bush-Cheney '04 campaign manager and former White House assistant to presidential counselor Karl Rove; and a host of other GOP politicos who share the building. Common sights in the driveway are the parked black SUVs and sedans, drivers always waiting at the wheel. Sporting U.S. government license plates and darkened windows, the vehicles are a sign that 2107 Wilson receives a number of high-level government officials along with their Secret Service security details. 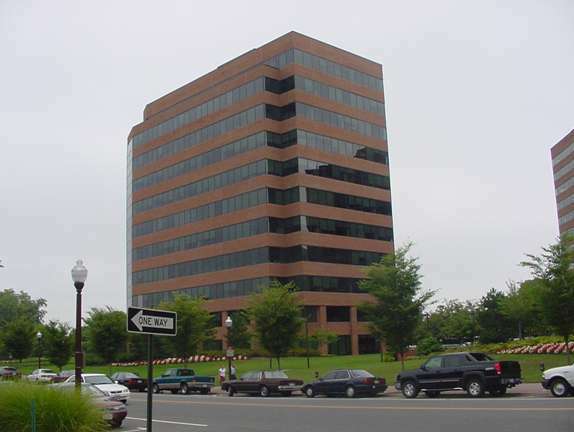 Bush-Cheney headquarters, 2107 Wilson Boulevard, Arlington, Virginia, sits amid defense, intelligence, and oil industry companies and lobbyists. Part time employees at 2107 Wilson include George W. Bush's two twins, Jenna and Barbara (although the building is surrounded by tap rooms and bars, there have been no reports that the two girls, known for their late night drinking sprees, have patronized any of the local establishments). Absent from the building are any campaign banners or signage indicating that this is the central hub of the national Bush-Cheney campaign. But there are telltale signs that a political campaign is being waged here. Above the maze of cubicles are televisions tuned into CNN (apparently even the Bush-Cheney campaign doesn't put much faith in Fox News and its politically biased, sensationalistic reports). Tacked to the occasional cubicle is a Bush-Cheney '04 bumper sticker or sign. Yet the Bush-Cheney operation, with all of its security cameras and guards, does not fully appreciate the importance of operational security. While recently walking past the building on a well-traveled pedestrian sidewalk that leads to the Court House Metro station, I noticed that on the first floor, in clear view of anyone who wanted to look, were two 25-inch plasma computer screens. Both had color-coded maps of the United States. Stopping to marvel at the data being represented on the screens, I realized that one of the screens represented GOP tracking polls. In many cases, such internal political party polls - which are always highly classified - represent truer numbers than what is being reported by the national media organizations. Quickly scanning the map, I saw that the GOP numbers are a matter of serious concern. Using blue for its safe states (possibly the GOP feels that using red is too socialistic for its tastes), the Bush campaign sees itself in a commanding position in most of the wheat belt Prairie states, the upper Rockies, and the Bible belt South. Using yellow for toss-up states, the GOP pollsters seem particularly concerned about Louisiana, Arizona, Nevada, Florida, Arkansas, Colorado, and North Carolina. Solid red states (in this case they are Kerry states) include the same states Al Gore won in 2000 with the addition of Ohio, West Virginia, and New Hampshire. If that is how the GOP is reading the political tea leaves, it is very bad news for Bush-Cheney. A roving private security guard chased me away from the sidewalk before I could ascertain what the second computer map represented but because Texas, California, Florida, and Arizona were identified by the same colors, it may have had something to do with GOP fundraising targets - all have large senior citizen populations. Several things stand out as striking. A recent suspicious package scare at John Kerry's national headquarters put that office suite front and center in the news. Suite 700 at 901 15th Street, NW, Washington was evacuated and searched by Federal agents and local police. Bush-Cheney headquarters, on the other hand, opts to hide behind a post office box in Arlington - Box 10648 located at the small local post office a few doors down the street on Wilson Boulevard. Missing from Bush-Cheney headquarters (building to the right rear) are campaign signs and protestors. The Associated Press is reporting that its analysis of statewide polling shows Bush in the lead for electoral votes. If the computer screen at Bush-Cheney 04 headquarters is any indication, the AP is way off the mark. One can only wonder how many other "public" polls are similarly skewed. Another amazing fact is that Bush-Cheney '04 national headquarters has not drawn any sizeable protests by citizens who oppose the Bush-Cheney and Republican Party agenda. Then again, the Washington office of Kellogg, Brown & Root, Cheney's old company and the Pentagon's favorite contractor in Iraq, is located a few blocks away at 1550 Wilson Boulevard and it has not drawn any protestors either. But much can happen between now and November 2.